If you’ve read this site carefully over the last 24 hours, you’ll recall that I’ve been discussing a scenario I’m calling the “Euro special.” (See, for example, here and here). Under this scenario, Harvey makes landfall along the central Texas coast, dithers around for a day or two, and then moves eastward, back over the Gulf of Mexico. During its latest run the GFS model latched onto this scenario, bringing Harvey back into the Gulf, before the system eventually moves north-northeast toward Houston or Beaumont, getting drawn toward a trough of low pressure in the Midwestern United States. Such a track raises a number of unpleasant possibilities. In the interest of a free and frank discussion, you’ll have to indulge some speculation with this post. But this is a mature audience that seems to appreciate honesty. So here goes. What we can say for sure is that a major rainfall event is almost certainly still in the cards for the greater Houston area from Harvey. All of the timing continues to suggest the really heavy precipitation will kick in later on Saturday or Sunday, so you still have some time to make preparations. But what happens after that, if the storm follows the hurricane center’s track, and moves up the coast Monday and Tuesday? 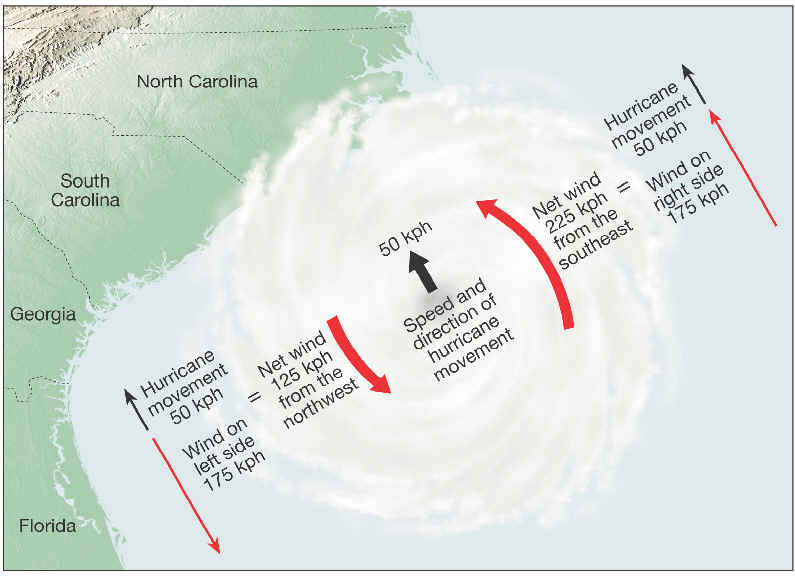 As you probably know, a hurricane’s counter-clockwise motion increases the wind speed on the storm’s right side, and pushes water into the shoreline. This is demonstrated by the generic graphic below. Unfortunately, because of this, we could be in a situation on Monday and Tuesday where a storm offshore and moving up the Texas coast from Corpus Christi—even if it is “only” a tropical storm—could be pushing a few feet of storm surge into Galveston Bay. At the same time, Houston’s many bayous will likely be staggering under tropical rainfall, trying to drain water into the bay, and out into the Gulf of Mexico. Needless to say this would exacerbate inland flooding issues. This is not to say that will happen with Harvey, but it’s very likely to occur if Harvey follows the path predicted this morning by the National Hurricane Center. Fortunately, as I mentioned earlier, the post-landfall track for Harvey remains far from certain, so it’s entirely possible this ugly scenario won’t play out. But it’s something we’re watching closely here, and just as we don’t try to hype things, we don’t sugarcoat them either. We’ll have a comprehensive update on Harvey later this afternoon, after the 12z forecast models come out. 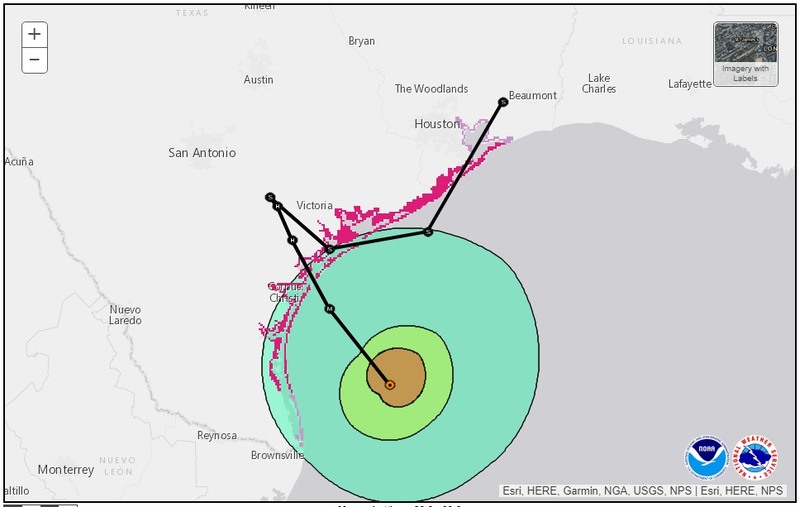 For now, all of the precautions and forecasts we wrote about this morning stand: A powerful hurricane will hit central Texas coast early Saturday, but major problems (i.e. flooding rains) are unlikely in Houston before Saturday night or Sunday. Inland flooding—potentially widespread and extreme—remains our biggest concern for Houston. Eric, all I have to say is thank you for your updates. agreed, always look forward to the information provided on this site. Here here Jim. Agree. Thank you for the updates Eric! Will travel from Dallas to Houston be attainable tomorrow afternoon with a DFW departure of around 2 PM? What will the road situations be like? I would feel reasonably comfortable making that trip. What about making that same drive at around 8pm? You all are the BOMB!!! I REFUSE to watch/listen to the tube as the grotesquely spread fear and trembling across the gulf coast! Thank you SO much for your TIRELESS efforts to keep us informed and as a result safe!! Thank you, thank you, THANK YOU for keeping us constantly updated!! I am sharing your updates with everyone I know here on the Bay…. The La Porte OEM has called for a voluntary evacuation as has Shore Acres…. I continue to post your updates on the La Porte Citizens Facebook page and on the Oyster Bay nextdoor email page….. Keep up the GREAT work Eric and again………………… Thank you! Thank you for your insight and updates! Our family loves your blog. Y’all are the best ~ thank you for your diligence and keeping it real. And the humor is helping me in a big way. Thank you, Eric. You’re the only thing keeping me from crapping my pants at this point. My wife and my neighbors down here next to JSC owe you for keeping me calm. “just as we don’t try to hype things, we don’t sugarcoat them either”. This is why I am so grateful for Eric. Thank you. BTW great job on NPR this morning. I second that emotion! Thanks Eric! Should someone in meyerland who wasnt flooded in tax day floods consider leaving? Would you suggest flying out of hobby on Sunday midday instead of Monday early morning? Thank you. I’ve been sharing your site widely. Very thorough effort, Eric. Well done. Eric, all I have to say is that you are the best! I never follow any weather person but you!!! Thank you so much! Does this increase the risk of power going out? So why is it that so many of the recent hurricanes have made landfall at night or early morning, usually on Friday-Saturday night? Ike, Rita, Harvey? Props, Karl, for making me look up the definition of a word! TIL how some connections are not real (apophenia). Thank you for your honest updates without all the drama. Thank you. We appreciate your updates! Great info. Very much appreciated to see your prospective! Eric, have any advice for those of us who live in Texas City? We had that 11 inches on tax free day and the house I live in has never flooded in 20 years. Should I be concerned? No better information than here. Thanks, Eric. 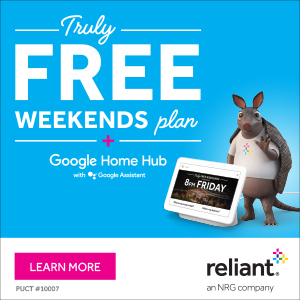 I really appreciate all of the native Houstonians who pointed me towards this website–great info. What is the best way to keep getting updates from yall if/when power goes out? Are you web only or do you expect to have some sort of radio presence once the actual storm gets here (if it gets here). Bookmark on your browser on each of your handheld/desktop devices. He’s a web presence only (except for special appearances from time to time like NPR this morning, Houston Matters (KUHF 88.7 FM) at noon this morning, and occasional tv spots). I’m so glad I have found you!! Thank you for an honest, factual report. I feel confident that I’m getting the truth. Why does the Weather Channel have a rain forecast like twice as bad as Local Weather stations? Did you see that “hoax” post on Facebook about 50 inches of rain South of I-10? Thank you for your weather reports. I have followed you for some time. Hi I live in Katy, should I evacuate? Thanks for all of the updates! Eric, ditto Jim’s comment above. It’s such a relief to get the facts as we know them and the best guess possibilities without the hype. Thank you Eric for your updates! Eric, you ARE the best!!! I don’t watch or pay any attention to the regular news media Hype. Frankly I think their over hype causes problems that finally no one pays any attention to them. Hunkering down in Katy/West Houston…Wine and a good book!! Thanks a lot for the very informative and educational updates. I didn’t know this website until this time, and it will be my main Houston weather source from now on. Thank you very, very much for you honesty and frankness. All your training comes into play with Harvey and really pays off for those of us lucky enough to have found this web site. I anticipate each of your posts knowing I will be well informed and can make decisions based on solid information and good judgement. The no nonsense clarity in these updates is much appreciated. Thank You. Being a meteorologist during a major weather event must be like being an NFL quarterback – the whole world becomes experts and chime in with their opinions about your performance!! Great post. Please update once you have used your meteorological predicative sorcery on the impending hurricane. We will pray for you as you engage in magical spell combat with Hurricane Harvey. Thank you in advance. What do you think the conditions for Tuesday will be like in Houston? Will the flooding have died down to allow for road traffic? Finally, an honest to goodness, no drama, no hyper weather forecast. Thank you sooo much. I just recently discovered this site. Thank you. The honesty without the hype is so refreshing! Keep up the great work. Thank you for your updates. I appreciate your logic and candor. We are scheduled to fly out of IAH on Tuesday at noon. We now have the option of changing that flight to be earlier or later. We need to be at our destination by Friday at the latest. Given the current situation, what do you think is the best time to try to fly out of Houston? What do you think flooding will be like in the Spring area? If Harvey follows the National Hurricane Center’s track and moves up the coast on Monday and Tuesday, what would be the wind impact be on the City of Houston? Thanks in advance for your response. Appreciate all of your efforts in keeping us informed in a rational manner. This site fills a hole that’s plagued my soul since I was old enough to read/watch the news. I love y’all. Thank you so much for this site. It was linked on Twitter and now I won’t go anywhere else for my weather. I’m supposed to fly to New Orleans today, and then fly back to Houston from NOLA around 11 am Monday morning – am I going to get stuck? Do you have a way we can donate to your blog efforts? Seems just saying “Thanks!” falls a little short, although thanks are due. I’d like to donate. I suspect a few others would also. You’re the only guy I ever listen to when we have a tropical threat. Thanks so much for continuing to give us sane forecasts, Somehow “Katy” never gets old for me. I have a flight out of Hobby on Monday morning. I’m guessing likelihood of that trip is low. Thoughts? Our biggest question is Monday. We had been planning driving home from Arkansas on Monday (live off GrndPkwy south of Katy, north of Richmond). Will the rain be significant enough to impede travel? That is a plausible concern we are watching closely. First, thank you for being a logical voice in a hysterical world. With no television service, I have, thankfully, only used your calm, rationale information to guide my actions. Next, what meteorological changes have occurred in the last 12 (or so) hoursto make the Euro model more relevant? Or, are the local weather sources just seizing on the “scariest” scenario? Euro is always going to get deference because, in recent years, it has proven to be the most accurate forecast model overall. That doesn’t mean it’s correct about Harvey, but there’s a better chance it is correct. This scenario would replicate Tropical Storm Frances. In the 22 years we have been on Tiki only Frances, besides of course Ike, shoved enough water over the the bulkheads that it came close to entering our garage…a few others whose garages weren’t quite as high did get water inside. Really appreciate your honest and realistic reporting! Thank you! Thank you for keeping it real. I cannot watch the local news or even the weather channel. The CONSTANT hype is instilling unnecessary fear. We need to be Calm and prepared! Just Kidding! Had to respond! Eric, what are your thoughts about the conditions not so far inland, e.g. around the JSC area? Do we benefit from being closer to the water (easier runoff/drainage of rainfall) or suffer (surge from Galveston Bay)? Typically around Clear Lake we rarely have problems in torrential rains because the drainage is comparatively fast. But the Euro scenario of course is a different beast… thanks for the great work. I appreciate the facts without “we are live at … where absolutely nothing is happening…” journalism. Have felt informed and not chaotic by keeping up with you!